Achieving the Dream announced the Open Education Initiative Degree Initiative on February 24. A team is already putting together a proposal to develop content for an open source GIS degree. Philip Davis reports he's part of a team including Adam Dastrup and Kurt Menke representing DelMar College, Salt Lake Community College and Central New Mexico Community College respectively. Per an update from Philip Davis: Del Mar College will not be proposing to this round of ATD. Adam Dastrup reports SLCC is preparing its own initiative unrelated to geospatial. Get your weekly GIS education update free, via e-mail, every Thursday. The UC Davis GIS MOOC will start approximately monthly, not every two weeks as originally suggested. The next session is already scheduled to start March 21. About two weeks ago Coursera launched Mentor-Guided Courses. Per Class Central, it's "a new initiative which allows learners to pay extra and get mentor support. 'Mentors' in this sense are professionals who work in the industry that a given eligible course is based upon." There's a fee (full cost $248, but "mentors" are currently "on sale" at $149) and currently only ten courses offer mentors. Should GIS MOOCs have mentors? Would you want to be a mentor? Would you pay for one? Esri is supporting Elmhurst College’s Skills for the Digital Earth MOOC, which runs from April 3-30 2016. Registration opened March 1. Here's the brochure (pdf) and an infographic (pdf) with stats about previous iterations. The course content remains the same as previous offerings. KQED asks and tries to answer the question, Can Teaching Spatial Skills Help Bridge the STEM Gender Gap? The answer is yes. And, it's supported by work I noted last week: this study (video) from Dr. Sheryl Sorby. Wing Cheung of the GeoTech Center argues that education can benefit from using a $99 GPS from Garmin. The work is funded by the National Science Foundation. The GeoTech Center is offering a March 16 event: Drone Law for Geospatial Professionals and Educators Webinar. I had the date wrong last week. UW-Madison assistant professor Rob Roth received a National Science Foundations Faculty Early Career Development (CAREER) Program award. His project work "integrates research and teaching around the topics of interactive, online, and mobile map design, and directly serves the emerging profession of UI/UX design, for which cartographers and geographers are uniquely positioned to fill." 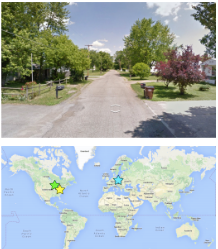 Google's latest deep-learning program PlaNet beats humans in determining where a photo without major landmarks was taken. The city of Chicago will require a computer science course for graduation. It'll be applicable to freshman starting in fall, 2016. Could that mean more use of GIS? Esri's Charlie Fitzpatrick discusses how ArcGIS Online can be part of a computer science education at the Education Community blog. Adrian O'Cooner has finished the research for his PhD at La Trobe University in Australi on Spatial professionals’ conceptions of spatial literacy. He's looking for some input from geospatial community. The University of Münster offers two scholarships for international (meaning non-German students) for its 4-semester MSc in Geoinformatics. The Digimap for Schools service has reached a 1,000 secondary school subscribers.The mapping system provides pupils across Great Britain access to the Ordnance Survey (OS) digital data. It's not free: The annual subscription costs £69 for a primary school and up to £144 for a secondary school. The AAG announced the Department of Geography at DePaul University will receive the inaugural Award for Program Excellence, which was established to recognize geography programs at U.S. colleges and universities without PhD programs. GISCI announced the dates of the summer offering of its Geospatial Core Technical Knowledge Exam in a press release. For further details on the development of the exam and its planned upkeep, read Rebecca Somers' recap in the Jan/Feb URISA GIS Professional (pdf). The Board of Intermediate Education in Prakasam district India is using GPS to help prevent cheating at 82 testing centers during exams scheduled from March 2 to 21. Mobile phones in and around the examination centers will be tracked and no one will be allowed to use phones inside. Now that's location based learning! 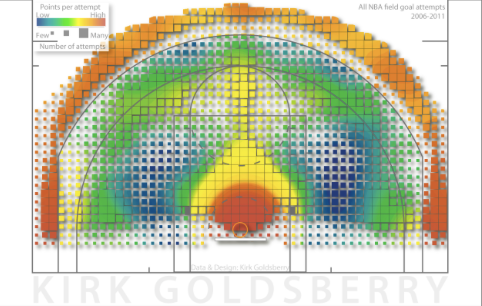 Kirk Goldsberry, a geographer at UT Austin and famous for his basketball "shot maps," has been hired by the San Antonio Spurs. The deadline for conference proposals for the National Conference on Geography Education (July 28-31, Tampa) has been extended until March 13, 2016. I'm not surprised. Michigan State offers an hour plus video of how it's using ArcGIS Server/Portal to manage its facilities. The presentation is part of the Campus FM Technology Association webinar series. Autodesk and Esri are the organization's two diamond level sponsors. Esri Canada is offering webinars from its research and education team in March and April. First up, Summarize Your Data and Perform Hot Spot Analysis in ArcGIS Online. It's Thurs March 10 at 2 pm EST. Next up: Integrating R with ArcGIS, which will be in two parts. The first is March 22. Mapping the Nation, which was originally a book, is now a collection of interactive government maps (all levels) from users. There are a number focused on education. And, some of the other maps will be useful in the classroom. There's a filtering tool to explore the ninety plus maps. Peter A. Knoop at the University of Michigan explains in detail the challenges of storing geodatabases in cloud storage solutions like DropBox. He does share a few ways it can work, too. There are other good tips in a Esri HigherEd-L thread from February. Videos from the ICA/Esri Cartographic Summit held Feb 8-10 are now online. The Esri Education GIS Conference will feature Dave Zaboski, former senior animator with Disney. He'll discuss creativity. Six things we learned from the LSE’s interactive map of the world’s largest cities - The CityMetric staff explains its takeaways from the London School of Economics map. Tech looks like Mapbox and Leaflet.